[The Barbary Sheep] The Aoudad. Ovis Tragelaphus. Coloured lithograph, trimmed to image and mounted on card with gilt title, as issued. Printed area 355 x 245mm (14 x 9½"), with very large margins. The Barbary Sheep of North Africa. From 'Zoological Sketches by Joseph Wolf. Made for the Zoological Society of London, from animals in their vivarium, in the Regent's Park', issued in two parts, 1861 and 1867. Joseph Wolf (1820-99), a German artist, specialized in natural history illustration, and is considered one of the great pioneers of wildlife art, having depicted animals accurately in lifelike postures. He worked with John Gould on 'The Birds of Great Britain'. Sir Edwin Landseer considered him 'without exception, the best all-round animal artist who ever lived'. Coloured lithograph, trimmed to image and mounted on card with gilt title, as issued. Printed area 330 x 235mm (13 x 9½") with text sheet, very large margins. 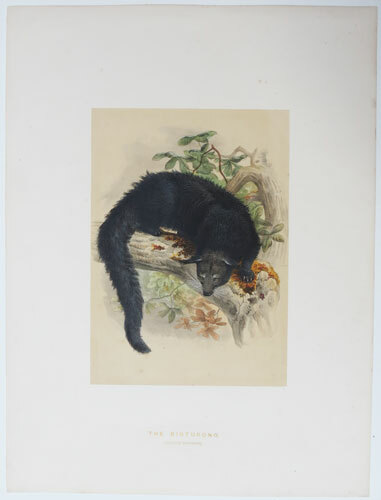 The binturong, despite being known as the bearcat, is neither a bear nor a cat, but a civit. A native of Indochina and Indonesia, it was first described by Sir Stamford Raffles in a 'Memoir of the Zoology of Sumatra; it is now a vulnerable species. From 'Zoological Sketches by Joseph Wolf. Made for the Zoological Society of London, from animals in their vivarium, in the Regent's Park', issued in two parts, 1861 and 1867. Joseph Wolf (1820-99), a German artist, specialized in natural history illustration, and is considered one of the great pioneers of wildlife art, having depicted animals accurately in lifelike postures. He worked with John Gould on 'The Birds of Great Britain'. Sir Edwin Landseer considered him 'without exception, the best all-round animal artist who ever lived'. Etching with fine hand colour. 440 x 310mm (17¼ x 12¼"), on laid paper watermarked 'G R'. 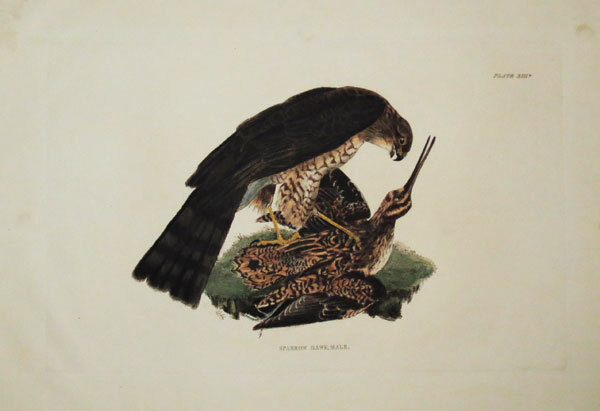 A fine etching from Hayes's 'Rare and Curious Birds Accurately Drawn and Coloured from Their Specimens in the Menagerie at Osterly Park', first edition. 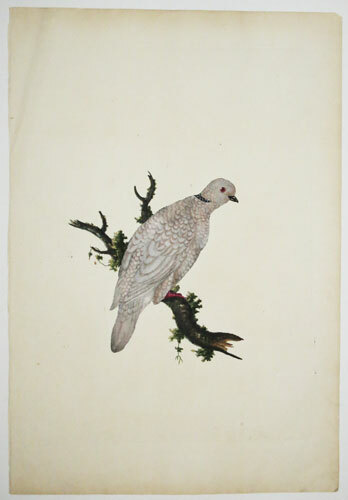 Hayes (1735-1802), a self-taught artist who had illustrated 'A Natural History of British Birds' in 1775, was commissioned to record the collection of live birds belonging to Robert and Sarah Child, the owners of Osterley. It was a family affair: he employed at least seven of his children as etchers, colourists and binders. The volumes were assembled when they were ordered, with the contents varying because of what has been called 'a production line of unrivalled chaos'. A second, posthumous edition was issued in 1817, 'published for the benefit of his family'. Études de Poissons. Raie, Maquereau, Brochet, Rouget, Anguille, Langouste, Homard et Ecrevisse. Peint et Lithog. par Gaildrau. Paris, L. Turgis J.ne Imp.r Edit.r r. des Ecoles, 60 _ Maison à New-York. Chromolithograph. Sheet 710 x 540mm (28 x 21¼"). Notch in right edge. 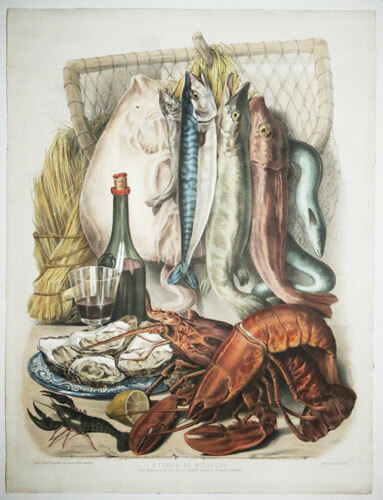 An array of fish and seafood, including a skate, mackerel, pike, mullet, eel, lobster and crayfish, around a bottle, glass of wine and a plate of open oysters. D'apres Mad.e P. Girardin. Imp. Lemercier Paris. Tinted lithograph. Printed area 490 x 330mm (19¼ x 13"), large margins with publisher's blind stamp. Some spotting. After Pauline Girardin von Schultz. [Carnations] Fleurs a l'Aquarelle. 5. Tinted lithograph. Printed area 490 x 330mm (19¼ x 13"), large margins, publisher's blind stamp. Some spotting. [Roses] Fleurs a l'Aquarelle. 1. Tinted lithograph. Printed area 490 x 330mm (19¼ x 13"), large margins, publisher's blind stamp. Pinhole in image, some spotting. F. Romanell del. C. Bloemaert sculp. Engraving, 18th century watermark. Plate: 305 x 215mm (12 x 8½''). Central crease. A scene showing figures kneeling before a part-human part tree figure, lying on the ground is a river diety. 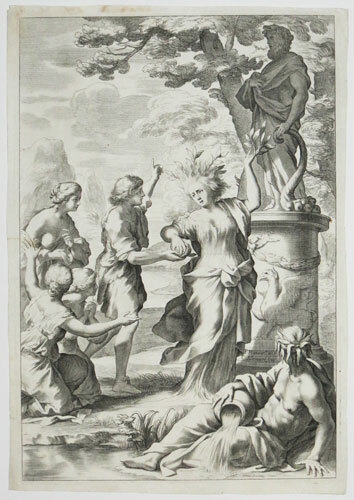 An illustration from 'Hesperides sive de Malorum Aureorum cultura...' by Giovanni battista Ferrari 1646 which was a scientific study of exotic fruits. Coloured lithograph, trimmed to image and mounted on card with gilt title, as issued. Printed area 245 x 345mm (13 x 9½"), with very large margins. A herd of hippos at the side of a lake. From 'Zoological Sketches by Joseph Wolf. Made for the Zoological Society of London, from animals in their vivarium, in the Regent's Park', issued in two parts, 1861 and 1867. 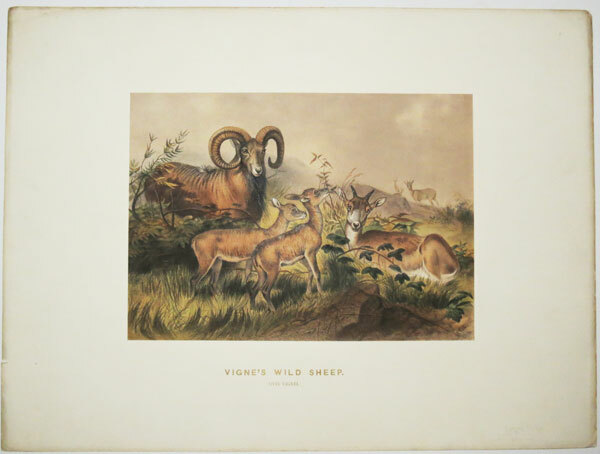 Joseph Wolf (1820-99), a German artist, specialized in natural history illustration, and is considered one of the great pioneers of wildlife art, having depicted animals accurately in lifelike postures. He worked with John Gould on 'The Birds of Great Britain'. Sir Edwin Landseer considered him 'without exception, the best all-round animal artist who ever lived'. Drawn from Nature Engraved & Publish'd as the Act directs by Cha.s Catton Jun.r. No.7 on the Terrace Tottenham Court Road London Feb.y 28 1787. Rare etching, with aquatint. Plate: 200 x 300mm (8 x 11¾''), with very large margins. 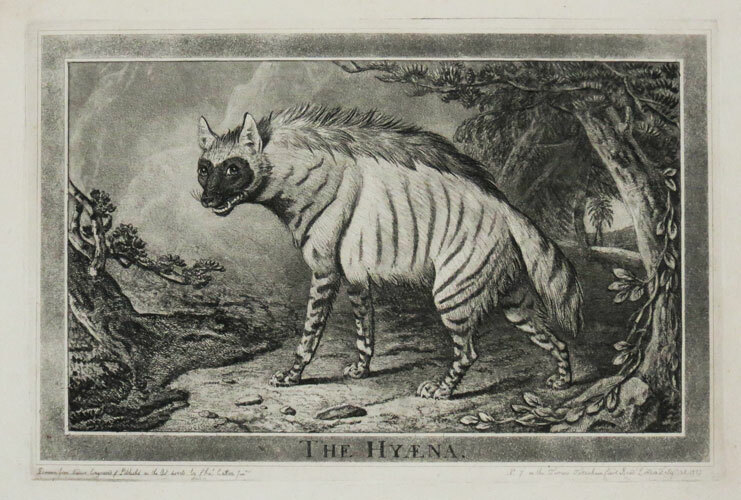 A portrait of an African hyena by Charles Catton II (1756-1819). Catton was the son of Charles Catton I, he entered the Royal Academy schools in 1775 and he exhibited at the Royal Academy between 1776 and 1800. He emigrated to the USA in around 1802. 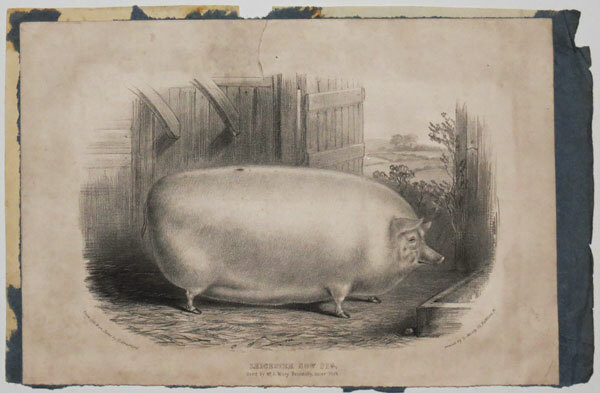 Leicester Sow Pig, Bred by Mr. S. Wiley Brandsby, near York. From life & on Stone by H. Stratford. Lithograph. Sheet: 170 x 250mm (6¾ x 9¾''). Laid on album sheet, staining. Tear at top. A portrait of a large sow in a barn. [Little Owl] Noctua Minor Aucuparia. Engraving with original hand colour. 420 x 280mm (16½ x 11"), 18th century watermark, very large margins. 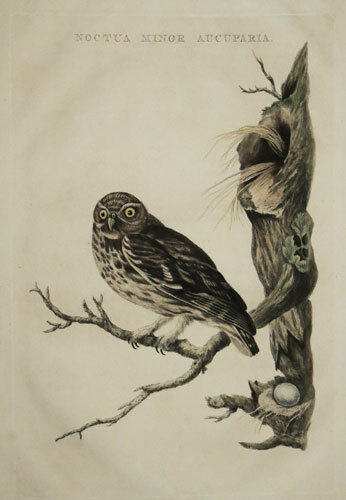 An illustration of a Little Owl (Athene noctua) with a depiction of its egg. 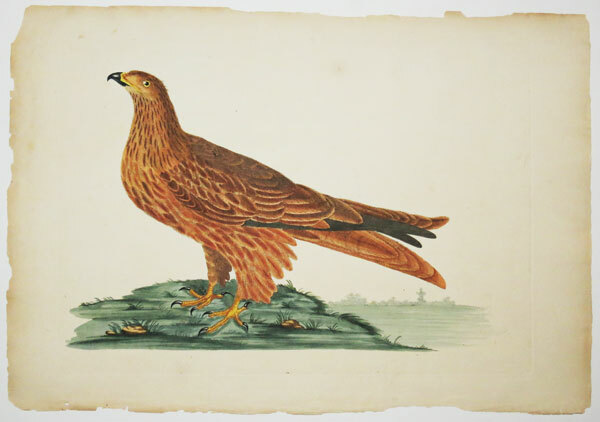 A plate from 'Nederlandsche vogelen' the first study of Dutch birds, published in parts from 1770-1829, with illustrations by Cornelius Nozeman, engraved by Christiaan Sepp, his son Jan Christiaan Sepp and grandson Jan Sepp. The markhor or Screw Horn Goat, the national animal of Pakistan. From 'Zoological Sketches by Joseph Wolf. Made for the Zoological Society of London, from animals in their vivarium, in the Regent's Park', issued in two parts, 1861 and 1867. Joseph Wolf (1820-99), a German artist, specialized in natural history illustration, and is considered one of the great pioneers of wildlife art, having depicted animals accurately in lifelike postures. He worked with John Gould on 'The Birds of Great Britain'. Sir Edwin Landseer considered him 'without exception, the best all-round animal artist who ever lived'. 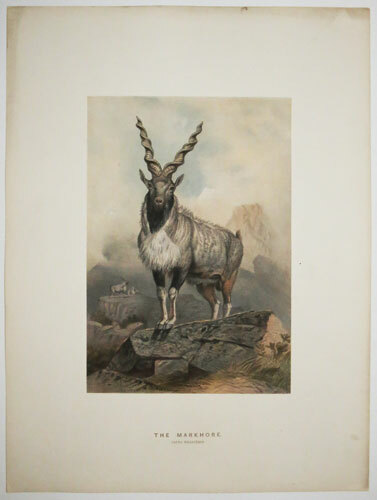 Lithograph with fine hand colour. Sheet 335 x 430mm (13¼ x 17"). A young merlin with its prey, in a coastal landscape. 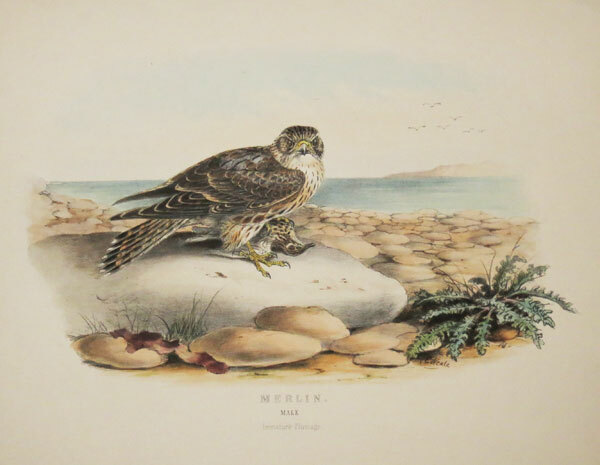 Edward Neale (1833-1904) provided illustrations for a number of bird books: this plate is probably from E.T. Booth's ''Rough Notes on the Birds observed during 25 years' Shooting and Collecting in the British Isles''. Etching with fine hand colour. 315 x 445mm. On laid paper watermarked 'J. Whatman', very large margins. A fine etching from Hayes's 'A Natural History of British Birds'. Engraving. 335 x 415mm (13¼ x 16¼"), with very large margins. Black pepper, one of the 791 plates in 'Horti Malabarici', a twelve-volume work by Hendrik van Reede tot Drakestein (1637?-91). The plant's name is rendered on the plates in Latin, Arabic, Brahmin and Malayalam. Engraving. 345 x 430mm (13½ x 17"), with very large margins. Bottom corners of margin worn. Also known as crêpe ginger, it is native to southeast Asia, where the rhizome has been used to treat fever, rash, asthma, bronchitis, and intestinal worms. One of the 791 plates in 'Horti Malabarici', a twelve-volume work by Hendrik van Reede tot Drakestein (1637?-91). The plant's name is rendered on the plates in Latin, Arabic, Brahmin and Malayalam. [A Sri Lankan lily] Bellútta-póla-Tály. Engraving. 340 x 420mm (13½ x 16½"), with very large margins. Bottom corners of margin worn. One of the 791 plates in 'Horti Malabarici', a twelve-volume work by Hendrik van Reede tot Drakestein (1637?-91). The plant's name is rendered on the plates in Latin, Arabic and Malayalam. Engraving. 350 x 440mm (14 x 17¼"), very large margins on 3 sides. Trimmed to plate on right, as issued. A botanical illustration of Vitex pinnata, a tree of the family Lamiaceae, native to south and south east Asia. Slow growing, the wood is used for construction and the manufacture of knife handles; the leaves and bark are used to treat abdominal pain, fever and malaria. One of the 791 plates in 'Horti Malabarici', a twelve-volume work by Hendrik van Reede tot Drakestein (1637?-91). The plant's name is rendered on the plates in Latin, Arabic, Sanscrit and Malayalam. Prize Shropshire Sheep. 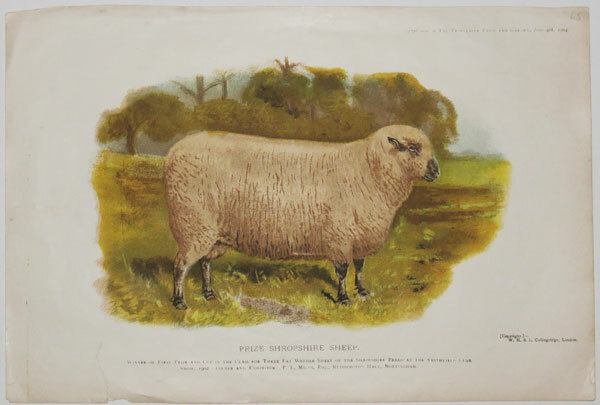 Winner of First Prize and Cup in the Class for Three Fat Wether Sheep of the Shropshire Breed at the Smithfield Club Show, 1902. Owner and Exhibitor: P.L. Mills, Esq. Ruddington Hall, Nottingham. Supplement to The Profitable Farm and Garden, June 4.th 1904. [Copyright.] W.H. & L. Collingridge, London. Chromolithograph. Sheet: 210 x 315mm (8¼ x 12¼''). Tears. A portrait of a prize sheep. [The Sika Deer] The Formosan Deer. Cervus Taivanus. Coloured lithograph, trimmed to image and mounted on card with gilt title, as issued. Printed area 245 x 355mm (9½ x 14"), with very large margins and text sheet. 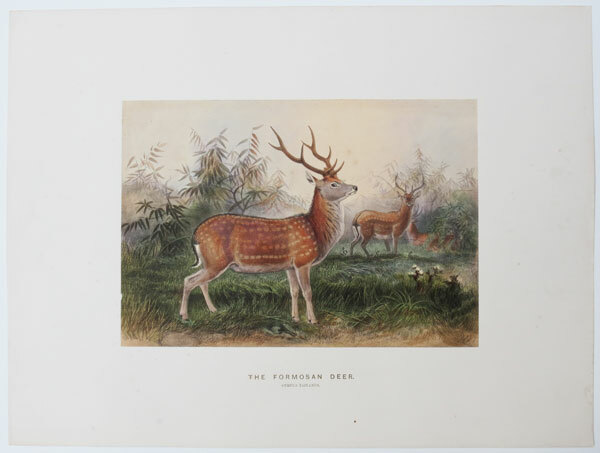 The sika deer (Cervus nippon), also known as the Japanese deer or the spotted deer (being one of the few deer species that does not lose its spots upon reaching maturity), From 'Zoological Sketches by Joseph Wolf. Made for the Zoological Society of London, from animals in their vivarium, in the Regent's Park', issued in two parts, 1861 and 1867. Joseph Wolf (1820-99), a German artist, specialized in natural history illustration, and is considered one of the great pioneers of wildlife art, having depicted animals accurately in lifelike postures. He worked with John Gould on 'The Birds of Great Britain'. Sir Edwin Landseer considered him 'without exception, the best all-round animal artist who ever lived'. [The Small Indian Civit] The Rasse. Viverricula Malaccensis. Coloured lithograph, trimmed to image and mounted on card with gilt title, as issued. Printed area 230 x 335mm (9 x 13¼"), with a letterpress description, very large margins. 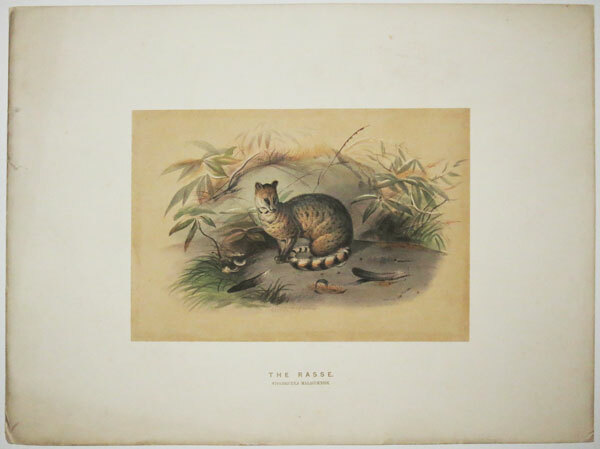 The small Indian civet, Viverricula indica, widespread through India and Incochina. From 'Zoological Sketches by Joseph Wolf. Made for the Zoological Society of London, from animals in their vivarium, in the Regent's Park', issued in two parts, 1861 and 1867. Joseph Wolf (1820-99), a German artist, specialized in natural history illustration, and is considered one of the great pioneers of wildlife art, having depicted animals accurately in lifelike postures. He worked with John Gould on 'The Birds of Great Britain'. Sir Edwin Landseer considered him 'without exception, the best all-round animal artist who ever lived'. [Candy Cane Sorrel.] Oxalis versicolor. Engraving with hand colour. 445 x 275mm (18 x 10¾"), on J. Whatman paper with large margins. 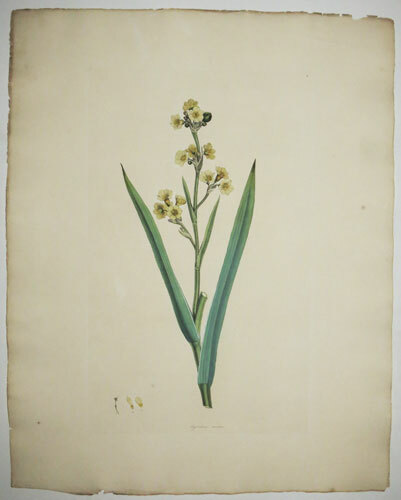 An illustration by James Sowerby (1757-1822) for James Edward Smith's 'Icones pictae plantarum rariorum descriptionibus et observationibus illustratae'. Engraving with hand colour. 455 x 285mm (18 x 11¼"), on J. Whatman paper with large margins. Uncut. Cornish bladderseed (Physospermum cornubiense). An illustration by James Sowerby (1757-1822) for James Edward Smith's 'Icones pictae plantarum rariorum descriptionibus et observationibus illustratae'. Sparrow Hawk, Female. Plate XIII. Engraving with hand colour. 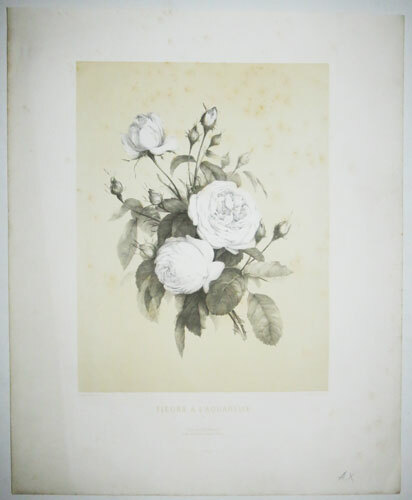 265 x 420mm (10½ x 16½"), on paper watermarked 'Ruse & Turner 1818', large margins. A little damp staining in margin. 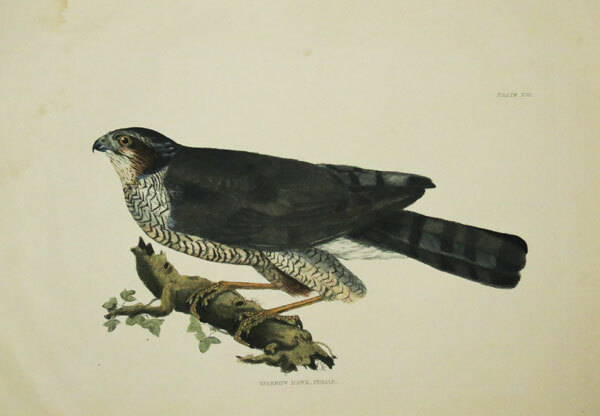 A female sparrow hawk, plate 13 of Selby's 'Illustrations of British Ornithology', published between 1821 and 1834. This was the first publication in which British birds were illustrated life-size. At the same time the publisher was also preparing the first plates for John James Audobon's 'Birds of America', also life-size. It is said that Audubon switched to Robert Havell Jnr in London after ten plates were finished because he felt Selby was receiving preferential treatment from Lizars. Sparrow Hawk, Male. Plate XIII*. Engraving with hand colour. 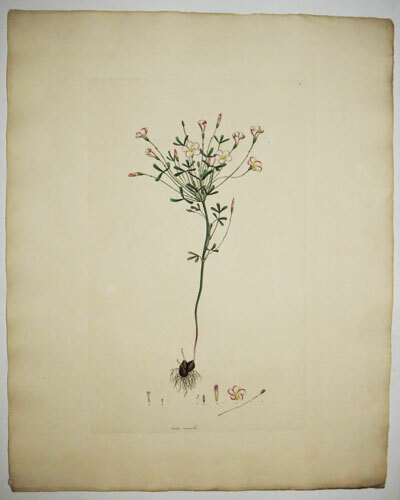 265 x 420mm (10½ x 16½"), on paper watermarked 'Ruse & Turner 1818', large margins. A sparrow hawk with an unfortunate snipe, plate 13* of Selby's 'Illustrations of British Ornithology', published between 1821 and 1834. This was the first publication in which British birds were illustrated life-size. At the same time the publisher was also preparing the first plates for John James Audobon's 'Birds of America', also life-size. It is said that Audubon switched to Robert Havell Jnr in London after ten plates were finished because he felt Selby was receiving preferential treatment from Lizars. Evert van Muyden '87. 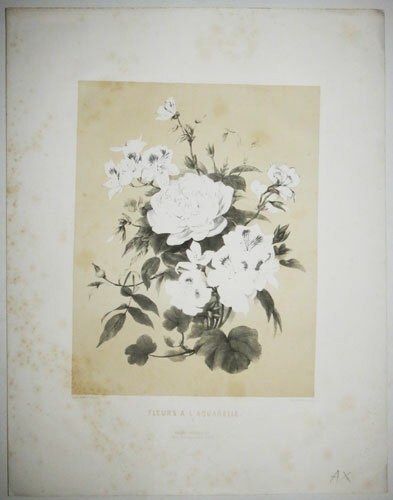 [in plate]. 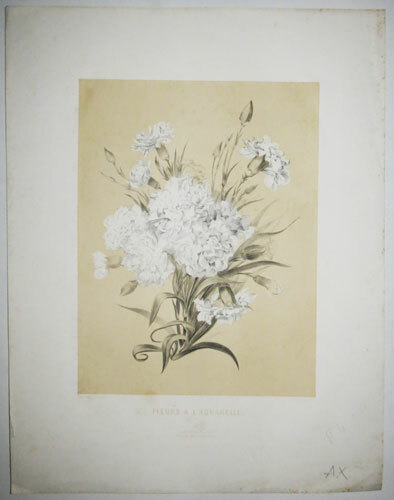 E. van Muyden [signed in pencil]. Etching on vellum, signed by the artist. 420 x 315mm (16½ x 12½"). Mount burn, taped stain in top margin, crease in margin. 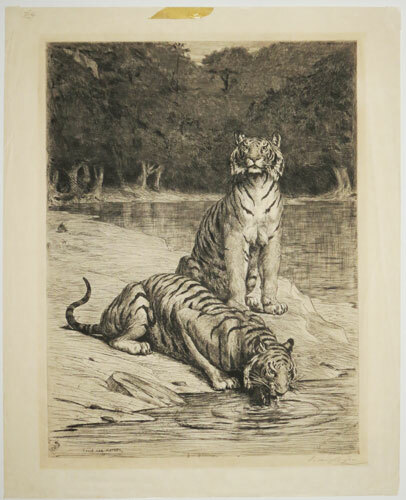 Bengal Tigers at a riverside, with a remarque of a tiger's head bottom left. Evert Louis van Muyden (1853-1922), born in Italy to Swiss parents. In 1894 the Art Institute of Chicago held an exhibition of over 200 of his 'Water Colors, Sketches, Pen Drawings and Etchings' including four states of this print. It was also illustrated in Frederick Keppel's 'The Golden Age of Engraving', 1910. Le Dindon. La Pintade. 43. Ed. Traviés. Imp. Becquet à Paris. Paris, Ledot Ainé, Rue de Rivoli 174. [n.d., c.1864). Lithograph with hand colour. Sheet 340 x 255mm (13½ x 10"). 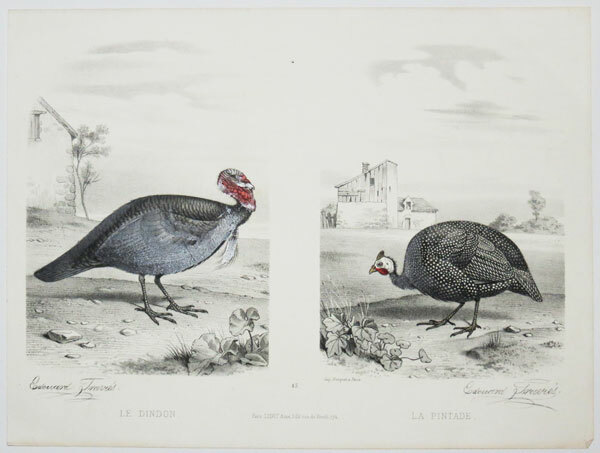 A pair of illustrations of a turkey and a guinea fowl after Eduard Traviés (1809-76), printed from two stones, published in the rare children's natural history book, ''Types du re`gne animal. Buffon en estampes'' by Henry-Alexis de Conty (1828-96). Lithograph with fine hand colour. Sheet 340 x 255mm (13½ x 10"). 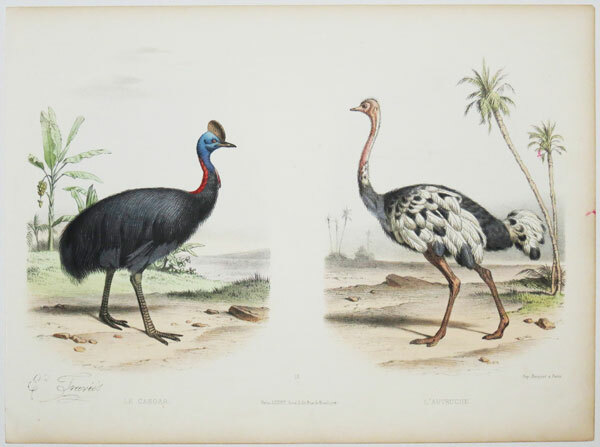 A pair of illustrations of a Cassowary and an ostrich after Eduard Traviés (1809-76), printed from two stones, published in the rare children's natural history book, ''Types du re`gne animal. Buffon en estampes'' by Henry-Alexis de Conty (1828-96). Le Cheval Arabe. Le Zébre. 5. Ed. Traviés. Imp. Lemercier, r. de Seine 57 Paris. Lithograph with fine hand colour. Sheet 340 x 255mm (13½ x 10"). Small tear in edge. 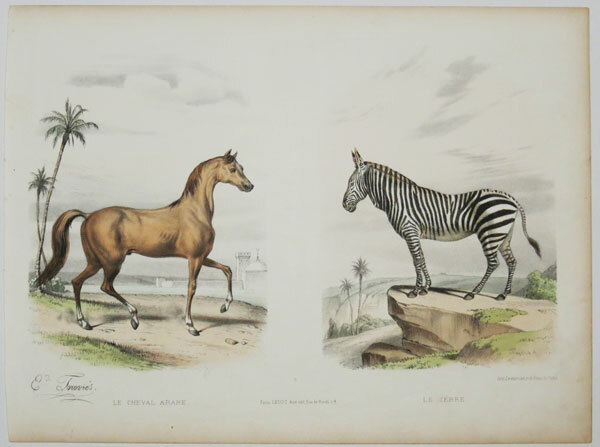 A pair of illustrations of an Arab horse and a zebra after Eduard Traviés (1809-76), printed from two stones, published in the rare children's natural history book, ''Types du re`gne animal. Buffon en estampes'' by Henry-Alexis de Conty (1828-96). Le Condor. Le Roi du Vautours. 15. 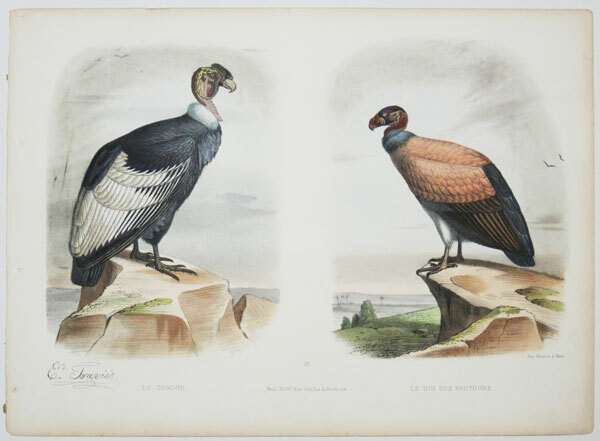 A pair of illustrations of two American birds, a condor and a king vulture, after Eduard Traviés (1809-76), printed from two stones, published in the rare children's natural history book, ''Types du re`gne animal. Buffon en estampes'' by Henry-Alexis de Conty (1828-96). Trees from Boim. The Su ping. The Chew kû or Goyavas. No. 143. Vol. IV Plate 45.p. 292. Engraving. Sheet: 170 x 205mm (6¾ x 8''). Trimmed and laid on album sheet. 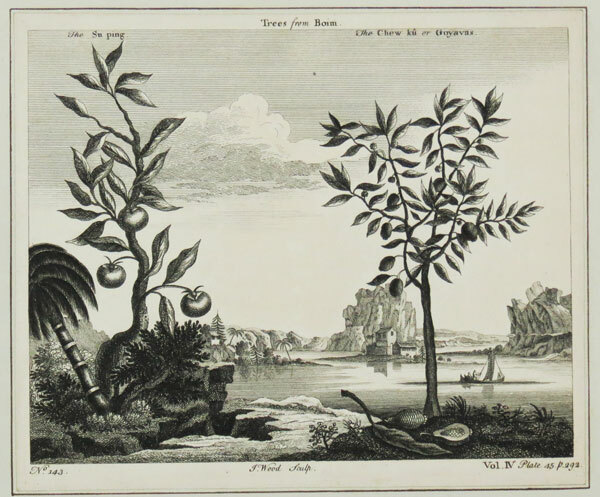 A diagram of two fruit trees from 'A New General Collection of Voyages and Travels', printed for Thomas Astley 1745. 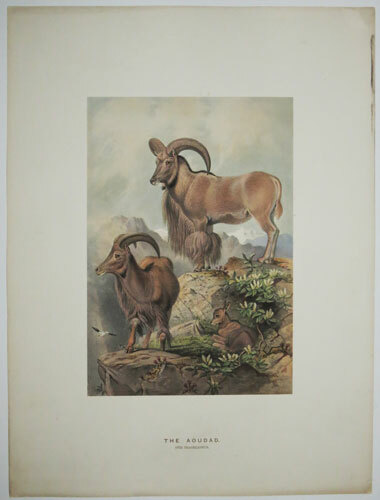 [Urial] Vigne's Wild Sheep. Ovis Vignel. Coloured lithograph, trimmed to image and mounted on card with gilt title, as issued. Printed area 245 x 340mm (9½ x 13½"), with very large margins. The Urial, also arkars or shapo, from central Asia. From 'Zoological Sketches by Joseph Wolf. 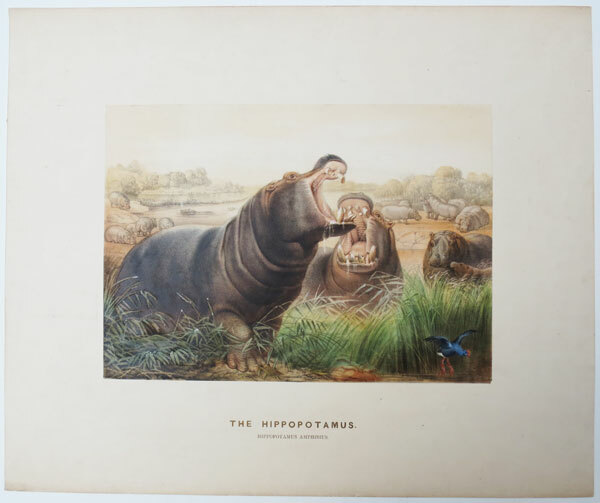 Made for the Zoological Society of London, from animals in their vivarium, in the Regent's Park', issued in two parts, 1861 and 1867. Joseph Wolf (1820-99), a German artist, specialized in natural history illustration, and is considered one of the great pioneers of wildlife art, having depicted animals accurately in lifelike postures. He worked with John Gould on 'The Birds of Great Britain'. Sir Edwin Landseer considered him 'without exception, the best all-round animal artist who ever lived'.